Back in September, a generation of online sports fans went into shock when @SportsbyBrooks posted its first tweet in nearly five years. 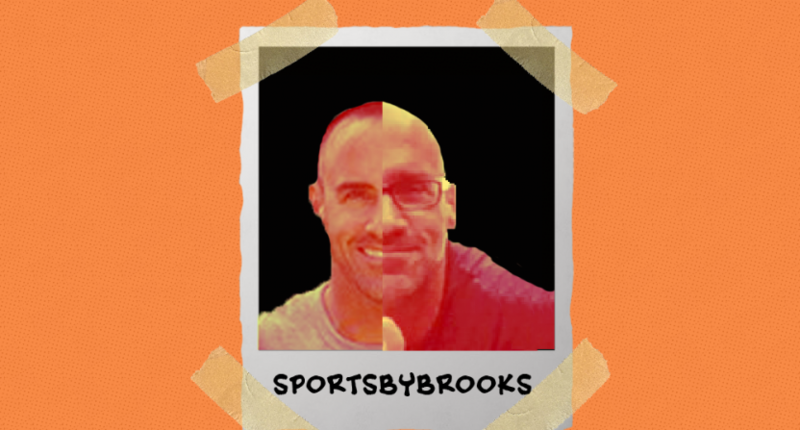 Started in 2001, Sports by Brooks was a pioneering, independent sports blog that would eventually come to be on par with other sports outlets like Deadspin and The Big Lead (predating both of them by years). It was run by Brooks Melchior, who ran the site as a hybrid of sports & entertainment news, gossip, opinion, and a healthy dose of scantily-clad women. Fast-forward to 2012 SbB had become big enough to break news before ESPN. Then, suddenly and without warning… Brooks disappeared. The site stopped updating in late 2012. The Twitterfeed was still active but… different. The last blog post went up in April 2013 and subsequent tweets between then and November 2013 seemed to change between conspiracy theories, software talk, and armed forces veteran appreciation. After that…silence. Until September 2018. Between those two dates, speculation ran wild about what had happened. “Whatever happened to Sports by Brooks?” became something of a meme even if everyone was actually asking the question out of genuine desire to know. Since returning, Brooks’ Twitterfeed has been populated mostly with old-timey college football videos and a focus on famous baseball player Jackie Robinson’s college football-playing days at UCLA. And while he confirmed a few details here and there with reporters, Melchoir hadn’t shared many publicly. And what was known wasn’t much. 1. He's alive & living in L.A.
3. He claims to have spent the last 5 years… researching football? Monday, ESPN’s Adam Schefter dropped an SbB bombshell by having Brooks Melchoir on for his very first podcast interview since returning from…wherever he’s been. Turns out, he’s been doing exactly what his Twitterfeed makes it seem like he’s been doing. If you look at my Twitterfeed today, you really have a sense of what I’ve been doing. What started me down this rabbit hole…getting away from the website for this hiatus…because I am gonna bring the website back in the first quarter of 2019, is learning about football history and specifically discovering Jackie Robinson. The first thing I remembered in this process developing a documentary series, which is what I’ve been doing over the last three and a half/four years, is that I discovered a piece of football of the Chicago Bears at Soldier Field playing against the college all-stars in 1941 and Jackie Robinson was scoring a touchdown against the Chicago Bears. 98,00 fans. George Halas is on the sidelines. And I saw this…I couldn’t believe. I knew that Jackie Robinson had played football at UCLA but I didn’t know that he was this big of a star. And I didn’t know football was that big, period. And so I started to look back at Jackie Robinson’s football career and I’m actually getting more footage in today from his games against Washington State when he played for UCLA. But that’s what started me down this road of learning about what a superstar football player he was in 1941. And then come to find out he never would have played for the Brooklyn Dodgers had it not been for his football career. Brooks says that his obsessive desire to learn more about Jackie Robinson’s football career ended up consuming his attention and shifting the entire focus of his career and life. I thought to myself…this is unbelievable. I mean this belongs in a textbook, Adam. Am I just gonna put this as a blog entry? Or am I gonna try to do a deep dive on Jackie Robinson’s life and learn more about his football career and it paid off in spades. Now I’ve got a documentary series that I’m working on…a three-part series about his football career, and that has led to other things. Brooks later says that he’s also working on a docu-series about the origins of college football itself. On paper, all of that sounds interesting enough. But the interview itself ends up taking some strange turns. Brooks spends a lot of time hyping up the Jackie Robinson vs. Chicago Bears footage, at least three different times throughout the interview, as if he’s discovered the Dead Sea Scrolls. And sure, it’s neat and all. Sounds like a solid 30 for 30 documentary. But it’s not as if there isn’t footage of Robinson playing football on YouTube already. Brooks also derails some of Schefter’s questions by going into protracted boasts about how amazing Sports by Brooks was. And sure, it was impressive for someone to start their own successful blog, credit where credit is due. But there’s also reason an image search of “Sports by Brooks” is almost entirely made up of women in bikinis. Like so many sports blog of the time, how you got pageviews was less important than whether or not you had them. It’s hard to listen to the interview and not think about what writer Jeff Pearlman said after killing a story about what happened to Melchior in 2016. While it doesn’t specifically call out an issue that Melchoir is dealing with, Pearlman is explicit that there is a mental health issue at the core of the story. Schefter read those comments to Melchior and asked for his reaction to it. His answer was…about Jackie Robinson. Amongst all the rambling, there is one thing Melchoir said that does feel like the clearest insight into who he is and what it’s like to be him. A story about what it was like growing up as the kid who always wanted to tell you about the thing he’d learned. I was one of those kids who would always come up with a crazy fact or an amazing current event. And all the little kids would be standing around and I would walk up to another six-year-old and say, hey, can you believe…the Chiefs won and this record or that record…and the kid would always say, “So?” And then you would say something else to another kid…”So?” So I was the kid running around school…doing that, and I’ve always been kinda consumed with…trying to get attention or impress people with facts, with information. You don’t want to extrapolate too much based on one podcast interview, but that story gives a lot of context as to why a guy might give up a popular sports website and disappear in order to invest his entire life into a historical moment that he hadn’t known about until then. Then it starts to make a bit more sense, at least to the outside world. Brooks also explained the meaning being the tweet that kicked off his comeback. The tweet contains a clip from Willy Wonka & The Chocolate Factory when Wonka, played by Gene Wilder, emerges for the first time in years. That was me acknowledging…look, I haven’t been around for a long time and maybe there’s some people out there that think I’ve been doing this or doing that, but really, since 2001, they’ve been saying that. I mean, when you write the kind of stories that I’ve written, and reported on institutions who exploit these teams and you’re breaking news, you’re gonna get a lot of blowback. So really from 2001 on it’s just been like that…I hadn’t been on Twitter for an extended period to answer any of those things. It’s unclear what kind of “blowback” Brooks is referencing, though he does bring it up multiple times in the interview. Melchoir told Schefter that he’s currently planning on bringing the site back in early 2019. And when he does, it’s going to be…something. How many people who started one website…a single person started a single website…turned into what my website turned into? I mean, how many times has that happened? Well, in sports, I mean it really hasn’t happened. In sports media. You have to have this total, complete, laser focus about what you’re doing. And with all of these external factors bearing down on you, including some of the sports media companies, as you’re doing this, you have to ignore all of it. You have to ignore everything on Twitter. And that’s what I’ve always done. What I’m doing is upgrading. I’m retooling. And it’s Sports By Brooks 2.0. It’s another dimension.